Jennifer is a Brevard County native and started her career in health care at the age of 18. She started working as an Anesthesia tech in the operating room. She completed her undergraduate degree at formally known Brevard Community College. She then pursued nursing and completed her A.S degree in nursing at Brevard Community College in 2007. She completed her bachelor’s degree in nursing in 2009 at University of Central Florida. 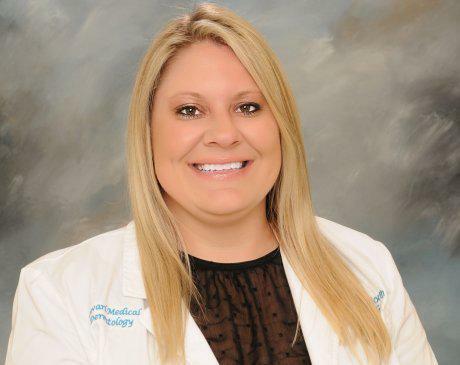 She continued her education at the University of Central Florida and completed her Masters in Nursing in 2011 with her Family Nurse Practitioner. She is certified by the American Academy of Nurse Practitioner’s holding the initials ARNP-C. She holds certification of BLS and ACLS. She has experience in family practice for several years within the community as an ARNP. She also has cardiology experience working at our local community hospitals as an RN and two years working as an ARNP with general cardiology as well as interventional cardiology group. She is looking forward to serving the community in our dermatology practice and helping you with all your skin needs. She has trained alongside Dr. Spicer at Brevard Medical Dermatology. She is married and has two dogs in which she loves very much. She is involved in donations for the local animal affiliations. She enjoys country concerts as well as all kinds of music. She loves trying new restaurants and her favorite dessert is chocolate.